In Poland, instead of celebrating Fat Tuesday or Mardi Gras like most everyone else in the world, they celebrate Fat Thursday. The holiday is aptly named, as just about everything you are supposed to eat on that day is deep fried, sugary, and delicious! Here are some of our favorite foods to have on Fat Thursday. If you happen to be in Poland on or around the holiday, these treats are normally readily available, with most of them actually being around all year! Pączki are a very important part of Fat Thursday. Lines snake around the outside of the buildings with the best pączki, and you can see Poles running around the city, stacks of donut boxes teetering in their hands. Pączki are very much like American donuts, but with a heavier dough and filled with delicious creams, chocolates, and jams. The most famous is filled with Rose Jam. Check out our article here on the best place to get hot pączki year-round in Krakow. But generally speaking on Fat Thursday you should just pop in every bakery you see and try theirs out! 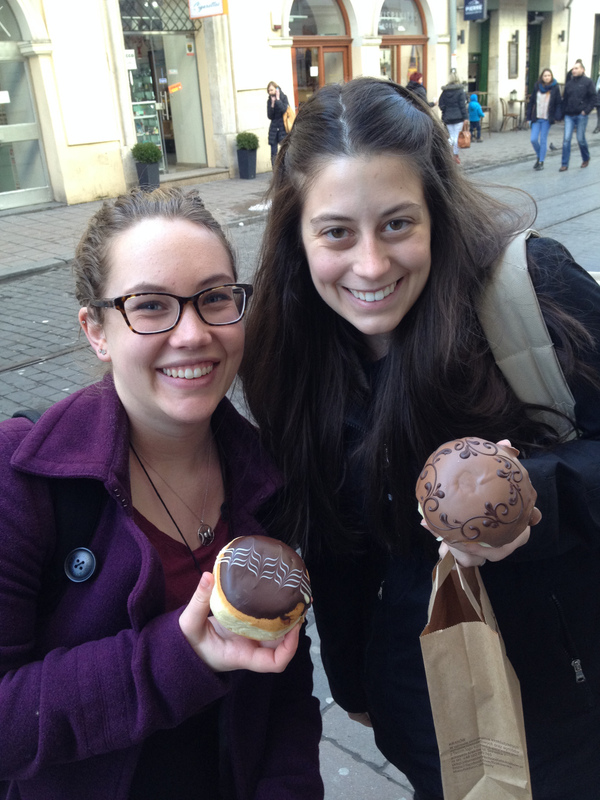 Last year we stopped by Hala Garda, Gorace Pączki, The Chocolate Manufacturer, and Auchan! Faworki are yet another fried treat for the holiday, that come with many names depending on the region you are from. They are made of a dough with vodka and cream and pounded with a rolling pin until the perfect consistency. They are traditionally cut into a twisted diamond shape, and thread through themselves, before being deep-fried. This dense pastry is definitely a must for Fat Thursday. So named for their “little tire” shape, oponki are like mini donuts, fried and then dusted with powdered sugar. Fat Thursday is not lacking in fat or sugar that’s for sure! It’s easy to eat too many oponki because they are so small and delicious. With Fat Thursday approaching it means that Easter is just around the corner as well! Check out all of our Easter in Krakow posts for Palm Sunday and Polish Easter Baskets and Traditions. Great post, but please, not “paczki” :( Aaaargh. If you need help finding an ą, please just ask, or let me know.